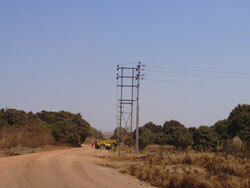 Shalina Resources successfully commissioned their 11kV electric transmission line which was successfully charged at 19:30hrs on 22nd October 2008 and has completed two weeks ,without interruption, now. The line is 12 KM long and runs from Usoke to Etoile Mines. Power to HMS I at Etoile mine is also provided on 23.10.2008 and is running on SNEL power since then. This line has enough capacity to power the new SAP under construction and other future plants. We are planning to charge the transformer at Etoile Mines office this weekend and complete public lighting at all along the road passing through Kiwele road, Zambia Marche latest by 20th November 2008. The public lighting will benefit to around 20,000 people residing in Zambia Marche, Ruashi etc and their local small businesses alongside the road. 80% of the erection work was done in house by Chemaf, including fabrication and erection of poles, mounting of insulators, light fittings, lighting transformers etc. Inhouse construction equipment was used such as specially ordered tele-handler machines. The line was charged at the first attempt and there was no tripping. A sincere congratulations to the entire team members for their efforts including Electrical team, Mechanical team, Civil team, Usoke and Etoile Garage team, especially the drivers.